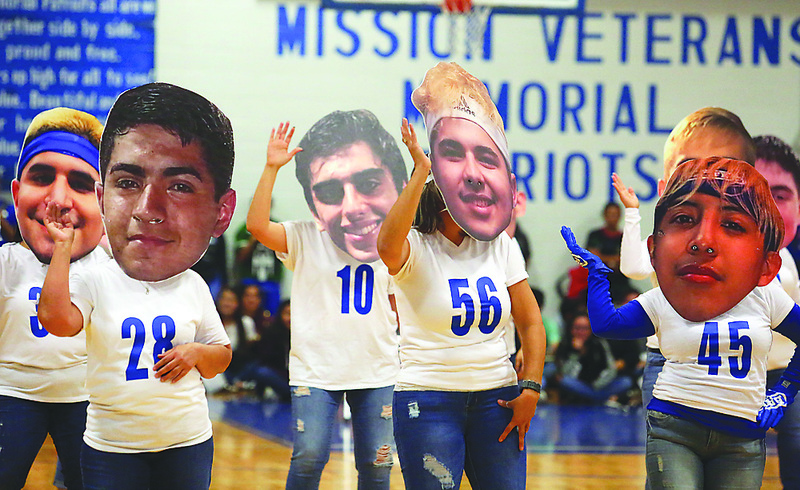 Joel Martinez | jmartinez@themonitor.com Mothers of some of the members of the Mission Veterans football team dance wearing large masks bearing the likenesses of their sons during a pep rally at Mission Veterans Memorial High School on Thursday in Mission. MISSION — The Mission Veterans Patriots football team has captured the attention and imagination of a city with a rich football history. When a city associated with names like Tom Landry, Lupe Rodriguez, Frank Hernandez and Koy Detmer are mentioned, championship football is the expectation. As the clock hit triple zeros in the Patriots’ 62-55 victory over previously undefeated Corpus Christi Veterans last Saturday in San Antonio, the city erupted. Residents drove down Conway Avenue, known as the dividing line between the Mission High and Mission Veterans school zones, honking their horns in ecstasy. For one night, the Eagles-Patriots rivalry didn’t matter. Mission was one again. Head coach David Gilpin’s phone was flooded with messages and missed calls after the game Saturday. Gilpin was especially swimming in congratulatory wishes from family, close friends and casual acquaintances earlier this week. Monday was Gilpin’s birthday. 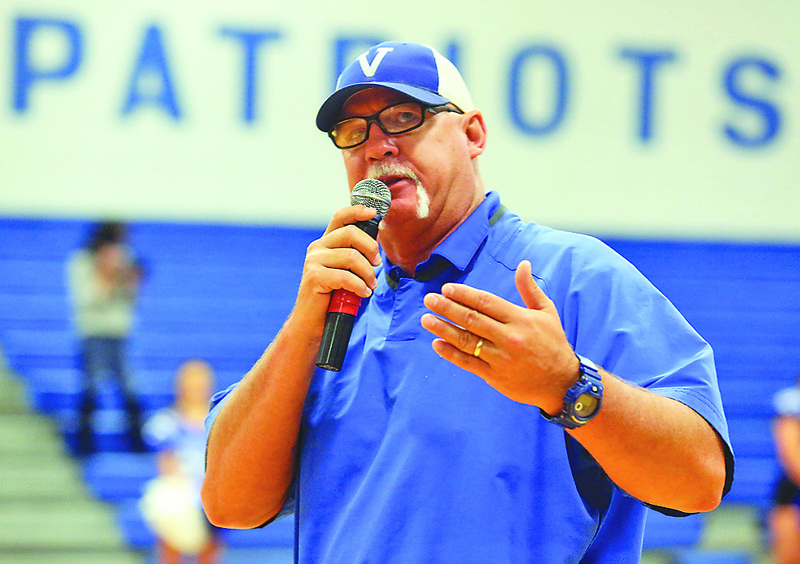 Head coach David Gilpin speaks to attendees during a pep rally for the Mission Veterans football team at Mission Veterans Memorial High School on Thursday, Dec. 6, 2018, in Mission. The Mission Veterans football team will be going against San Antonio Wagner in the fourth round of playoffs in a game at the Alamodome in San Antonio on Saturday morning. 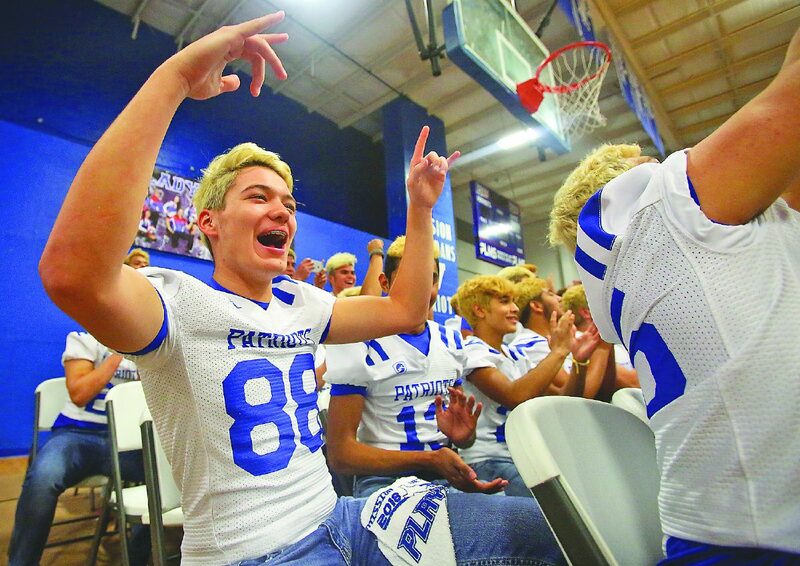 Football fans from across the Valley have called Mission CISD’s central office inquiring about ticket availability for Mission Veterans’ first-ever fourth-round matchup against San Antonio Wagner. Kickoff is scheduled for 10 a.m. Saturday at The Alamodome in San Antonio. Venecia’s restaurant is a sponsor of the Mission CISD athletic department. Venecia also had the opportunity to coach Patriots wide receivers Mikey Garcia and A.J. Gonzaque when they were much younger. Venecia coached Garcia in flag football and a five-year-old Gonzaque in soccer. Mission Veterans fans packed the school’s gymnasium for a pep rally Thursday night before the team travels to San Antonio today. Regardless of how Saturday’s game ends, Gilpin wants his kids to have a measured perspective about the most successful playoff run in school history.